“We know that nothing compares to travel mangers being able to visit and experience the Philippines for themselves. Visiting our truly world-class destinations, hotels and resorts, enables them to see how the Philippines is ideal for a broad range of their client base. This reverse roadshow not only provided essential information on tourist destinations and tour packages, but also offered the opportunity to experience the destinations themselves in order to better sell the Philippines. It also allowed the participating independent travel managers from Australia to build relationships directly with suppliers. 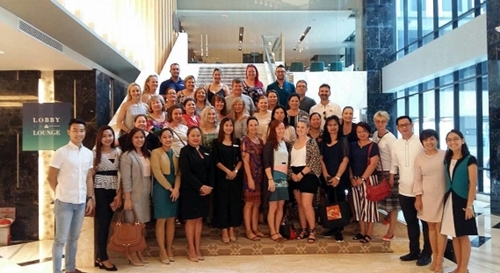 “The roadshow also aimed to highlight the sights and experiences in Manila and Cebu; which are the main gateways for Australian travellers visiting the Philippines. As independent travel managers handle a wide variety of clients, including corporate and incentive travellers, the reverse roadshow aimed to reveal the diversity that Cebu and Manila offer as travel destinations. As the Philippines is renowned for offering travellers the ultimate tropical paradise, the reverse roadshow separated the group into two, with one group visiting Cebu, and the other travelling to Bohol for familiarisation tours,” said Delos Reyes. The Philippine Department of Tourism would like to thank all of the tourism organisations in the Philippines who participated and made the roadshow possible. In Cebu, this included: Bai Hotel; Radisson Blu; Movenpick Resort; Bohol Beach Club; Plantation Bay Resort & Spa; South Palms; Philippine Airlines; and Uni-Orient. In Manila: Crimson Boracay; Bellevue Bohol; Bluewater; Air Swift; The Lind Boracay; Tugawe Cove Resort; Donsol Eco Tour Inc., Uni Orient Travel; Conrad Manila; The Farm at San Benito; Travelexperts; Crimson Alabang; Henann Boracay; Raffles & Fairmont; AG New World Manila Bay Hotel; The Oriental Hotel; Diamond Hotel; Eskaya Beach Resort; Tribal Adventures.